The ATLAS particle detector at the European Organization for Nuclear Research (CERN) outside Geneva is 150 ft. long, 82 ft. high, weighs 7,000 tons, and contains enough cable and wiring to wrap around Earth's equator seven times. It's a mammoth machine, designed for the delightful purpose of detecting particles so tiny, you can fit hundreds of billions of them into a beam narrower than a human hair. ATLAS occupies just one small corner of the strange and wonderful world that is the Large Hadron Collider (LHC)  the circular, 14-mile-underground particle accelerator that promises scientists untold insights into the mysteries of the cosmos. More than 25 years in the planning, with a price tag of about $10 billion, the LHC officially  finally  began smashing protons together on March 30. The goal: to answer the most fundamental questions about how the universe works. The first and most important order of business is to prove (or disprove) the existence of a single particle known as the Higgs boson  a speck so precious that it has come to be called the "God particle," a reference to the theory that Higgs gives mass to all matter in the cosmos. The significance of the God particle is as old as time itself: scientists believe that at the moment of the Big Bang, when the universe was born, there existed a moment of incandescent beauty  of perfect symmetry  in which all things and all forces were in absolute agreement. The universe's four forces  the weak force, strong force, electromagnetism and gravity  had yet to differentiate, and the tiny particles that carried those forces had yet to emerge as separate entities. As the explosion cooled and its contents scattered, complexity engulfed the universe, splitting its symmetry asunder  a cosmic parallel to Adam and Eve. The goal of modern theoretical physics is to reveal the universe's lost elegance. A major breakthrough in that effort came in 1964, when Peter Higgs, a shy British scientist in Edinburgh, introduced a theory that could explain how particles that carry two of the four forces  those that carry the electromagnetic force, and those that carry the weak force  came to have different masses as the universe cooled (in the moment after the Big Bang, of course, nothing had mass, existing instead in a sort of naked, ethereal beauty). Extrapolating from Higgs' theory, scientists were able to explain how all particles get their mass  which would explain, in turn, how everything in the universe, from scientists at CERN to the grand Jura Mountains that surround them, comes to have weight. It works like this: Across the postBig Bang universe, collections of Higgs bosons make up a pervasive Higgs field  which is theoretically where particles get mass. Moving particles through a Higgs field is like pulling a weightless pearl necklace through a jar of honey, except imagine that the honey is everywhere and the interaction is continuous. Some particles, such as photons, which are weightless particles of light, are able to cut through the sticky Higgs field without picking up mass. Other particles get bogged down, accumulating mass and becoming very heavy. Which is to say that even though the universe appears to be asymmetrical in this way, it actually is not  the Higgs field doesn't destroy nature's symmetry; it just hides it. The way to find the Higgs boson is to create an environment that mimics the moment postBig Bang. The powerful LHC runs at up to 7 trillion electron volts (TeV) and sends particles through temperatures colder than deep space at velocities approaching the speed of light. (The second most powerful particle accelerator, at Fermilab in Illinois, runs at 1 TeV.) The added juice allows scientists to get closer to the high energy that existed after the Big Bang. And high energies are needed, because the Higgs is thought to be quite heavy. (In Einstein's famous equation E=MC2, C represents the speed of light, which is constant; so in order to find high-mass particles, or M, you need high energies, E.) It's possible, of course, that even at such high energies, the Higgs boson will not be found. It may not exist. But if it does exist, the Higgs would help plug a hole in the so-called Standard Model  the far-reaching set of equations that incorporates all that is known about the interaction of subatomic particles and is the closest thing physicists have to a testable "theory of everything." But many theoreticians feel that even if the Higgs boson exists, the Standard Model is unsatisfactory; for instance, it is unable to explain the presence of gravity, or the existence of something called "dark matter," which prevents spiral galaxies like our Milky Way from falling apart. Even the mighty Higgs cannot explain those mysteries  though through telescopes and observation, we know they exist. Given the problems with the Standard Model, some physicists have come up with elaborate alternatives to explain the workings of the cosmos, including the existence of multiple, alternate dimensions, or hidden "supersymmetric partners" to all the universe's particles. To them, failure to find the Higgs  or finding the Higgs among an ensemble of strange and new particles  would be welcome, since it would suggest that more ambitious theories are needed. Out on the cusp of human knowledge, particle physics can seem esoteric indeed. 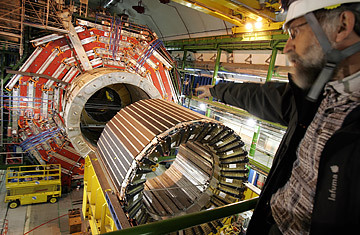 But the LHC's findings may have implications that go beyond pure science. CERN, a pan-European project dedicated to peaceful nuclear research, was founded in the late 1940s as a sort of atonement for the legacies of Hiroshima, Nagasaki and two wars during which Europeans slaughtered one another by the millions  many of CERN's elder scientists vividly remember the instability, randomness and despair that characterized that era. If scientists at CERN are able to locate the Higgs particle in the early years of this new century, it would shore up the basic scientific tenet that what exists at the very foundations of our universe is beauty and unity. It's something to continue to strive for, at least.